Dentists prefer to restore injured, decayed, infected or otherwise failing teeth rather than extracting them. Missing teeth impact how well people bite, chew and speak. The bigger the smile gap, the greater the facial changes, such as premature wrinkling and skin sagging. If your Norwood dentist does not replace missing teeth with dental implants or traditional crown and bridge, remaining teeth drift to fill the space, weakening and losing proper alignment. Frankly, no matter how good a dental restoration is, a natural tooth is always preferable. The process of tooth extraction is usually straightforward, often needing nothing more than local anesthesia (pain shot). The dentists at Central Dental Associates possess the experience and expertise for more complicated extractions as well and may recommend oral conscious sedation or nitrous oxide along with local anesthesia to numb the area. 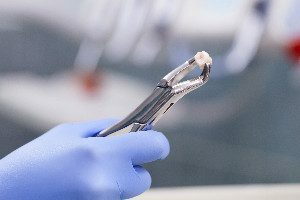 After the dentist pulls a tooth, he or she places sutures to close the gums and asks the patient to bite on sterile gauze to stop bleeding. At home, ibuprofen as needed controls any pain, and the patient should eat a soft diet for a few days, avoiding drinking with a straw. Refrain from smoking for 2 to 3 days as well. To quell infection, rinse with warm salt water several times a day for a few days. Additionally, take antibiotics if prescribed. Return to Central Dental Associates as needed or if the dentist used sutures requiring removal. If you have a questionable tooth, don’t neglect it. Get to Central Dental Associates so your Norwood dentist can evaluate it. Contact the office staff for an appointment.